So the Crab and Lobster are heading off early this morning on a road trip to visit some friends in San Diego. We're psyched! Anyway, in addition to being the home of cool friends, San Diego was my old college stomping grounds. (I'm a UCSD alum, Revelle College, class of 19.. ahem, cough, cough mumble mumble). So there are a number of important scholarly questions I must research! Like: What sort of innovative health studies are going on in those campus science labs? Is Filippi's Pizza still there? How about that cheap Mexican restaurant near the racetrack that used to serve wine margaritas to college freshman without even requiring fake id? Are the health needs of the San Diego population being met in a comprehensive and sustainable matter? Is Black's Beach still clothing-optional? Is La Jolla still beautiful and snooty? Is Hillcrest still gay?) I shall clearly be very, very busy collecting important data. Anyway, with the Crab off on another road trip, and it being Friday...what does that all add up to? Yep, you guessed it--a random mess of leftover research and random links and silliness instead of a real post. But fear not, Merry will be wearing the Crankypants this coming Monday, and the Crab hopes to get her act together with a post that's actually about something health-related on Tuesday. In the meantime... let's get rolling with the randomness, shall we? Keep in mind that being merely overweight is not necessarily a health risk--in fact, research suggests those who are overweight but not obese actually tend live longer than those who have a normal BMI. However, obesity is a health risk, and a recently-released health survey says there are now more obese Americans (34%) than those who are merely overweight (32.7%). Also, with the cratering economy, many health professionals are worried that even more folks will put on "recession pounds." They say "cheap sources of calories tend to be high in total fats and sugars." Facing Surgery? Will Your Surgeons Use a Checklist? Most people would see this study on the effectiveness of surgery checklists as a positive thing--after all, once these checklists were instituted at various hospitals, patient mortality rates were cut nearly in half and complications decreased by more than a third. But yikes! As a worrywart, this study made me even more nervous about ever needing surgery. In the article, it was noted that even after new policies were instituted, compliance with checklists still wasn't great. And experts are skeptical whether surgeons will keep using the checklists, or will start blowing them off once no one is watching them all that closely. Some of the issues these checklists address, like--is this the right patient? Did we leave any sponges inside?--you really hope someone is double-checking on. There are a LOT of reasons why you need to get enough sleep. A recent study adds yet another one: a better ability to fight off cold viruses. People who slept less than seven hours a night were about three times more likely to get a cold than people who slept eight hours or more a night. Was anyone else terribly sad to hear that the amusing and thought-provoking blog Elastic Waist closed its doors at the end of 2008? (Conde Nast, tsk tsk!) However, the bloggers behind Elastic Waist didn't go away, thank goodness, and you can still catch up with their exploits at their individual blogs, or at their new portal site, Dearest Mabel. Also listed as a potential contributor to Dearest Mabel is Jennette Fulda, otherwise known as Pasta Queen! Sounds cool huh? Cranky Fitness wishes all the best for the future success of Dearest Mabel. 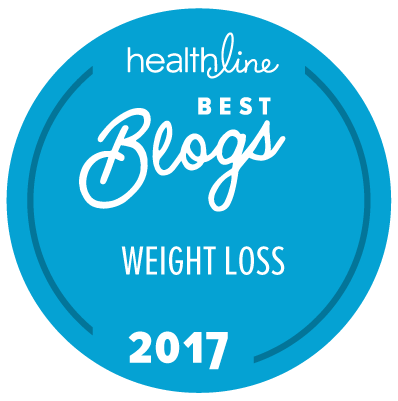 And if you haven't updated your bookmarks--many of you have already caught the fact that Leslie Goldman, formerly of the Weighting Game, has moved to a different corner of iVillage and now blogs at Never Say Diet. She also had a great (and scary) piece in Health Magazine recently about her neck/back injury. (I caught it in the print copy; the online link wasn't up yet last time I checked, but be sure to look for it). Well, apparently lots of folks are these days. How else to explain the exploding popularity and media coverage of websites such as Cute Things Falling Asleep? (Warning: do not attempt to operate heavy machinery after watching this). Seriously, if you like cute, this is the place. Hope you all have such glorious, non-stressful weekends that you don't even need to watch cute sleepy furry things to unwind! That was the cutest (the sleepy puppy)! Doesn't help my insomnia, but darn cute. Have a good time in SanDiego! Ha! I am totally in love with that pupster! I'd like one...now...thanks. Weekend plans are pretty sparse, a little bit of this a little bit of that, mostly involving the couch and television, woohoo! I was also very sad that Elastic Waist is going away. Definitely a shame. Have a good trip Crabby! Here's hoping elastic waist is merely going on hiatus. To return revamped as Drawstring Pantz perhaps. The idea of surgeons blowing off the checklists as unneeded scares the tar out of me. Who do they think they are, infallible gods? (Oh, wait, that's right, some really lousy doctors do think that!) Even when I'm in charge of something, I like the idea that I'm accountable to someone or have a list protocol to follow. It helps catch mistakes faster and earlier, when they are more easily corrected. It'll take a good bit of cuteness to get me over thinking about the bad things that can happen in surgeries gone wrong. Thanks for the great links. I lived in CA briefly and after I moved from Long Beach down to San Diego I would say I loved San Diego the best! Aw, that pup was adorable! Have a great trip, Crabby and Lobster! I agree with your comments on the surgery checklist thing. Yikes! Make sure you have the right patient? Hopefully by living a healthy lifestyle you can avoid the surgeon's table and someone leaving a sponge in your stomach! Yeah, that pilot picked the softest thing he (I think) could find to land on! Beyond wonderful! I wrote about check lists, pilots and surgeons a while back. Sleepy puppy was almost too cute. Nuking the Christmas lights put me back on track. Enjoy the road trip. Sounds like your research will keep you busy. That puppy made me simultaneously tear up and throw up in my mouth a little. Sorry. And skiing this wonderful three-day weekend! Wahooooo! Ugh, that reminded me of how much I want a doggie. Weekend plans are a bit sparse, but probably involve ice skating or rock climbing. Thanks for the link to microwave stuff. It's just what a co-worker and I needed today. No such thing as cute overload! Am going to go check out Dearest Mabel- I was so sad when Elastic Waist was shut down. Hey, three cheers for the Hudson River being a mile-wide placid open waterway just begging to have a plane set down in it. If I had to crash-land anyplace, THAT WOULD BE IT. Also three cheers that they didn't run into the GWBridge which is my favorite bridge in the world. OMG, that was beyond cute. I sooo wish I could take a nap right now. That puppy is sure cute, but, I loved the exploding eggs! The Christmas lights were very cool though. Ahem -- does this trip down south have anything to do with Monday being a National Day of Service? Make it a Day On... Not a Day Off! I think you could pick up trash along side the freeway on the way down. Oh, and you can stop and have tea with me in Scruz. I really really don't understand why the research about people with "overweight" BMIs living longer hasn't gotten more attention. I mean, seriously, we are messed up as to what we consider healthy and yet nobody talks about this!!! Anyhow, I need more sleep. That's a fact. Have fun in San Diego!! 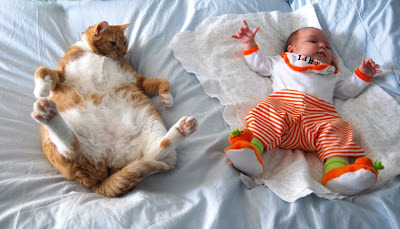 Adorable puppy, kitty and baby!!!!!!!! "Is Black's Beach still clothing-optional?" If I remember what I read in the AANR bulletin correctly, it is. I've been meaning to get back to San Diego since my first visit in 1986. Eat lots of Mexican for me. Since I'm not there you can have my share, can't you? Achoo! Yup, not enough sleep. I envy that adorable little pup. Thanks all, for stopping by! 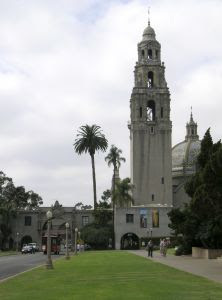 Chasing Pavement, I'm staying with friends right near Balboa Park so will look for the photo shoot. Congratulations!!!! The weather is even more wonderful that normal here, so we're enjoying every sunny moment. (Sorry, for all the folks shivering in the cold).